La Misa Negra is a 7-piece band from Oakland, California, known for their unique blend of heavyweight cumbia and high-energy, Afro-Latin music. On stage, they deliver an electrifying performance that explodes with infectious dance grooves and punk rock energy, powered by horn and accordion-driven riffs, a fierce rhythm section, and a vintage-inspired sound. Since their live debut in the fall of 2011, La Misa Negra has toured the country, sharing stages and festival bills with the likes of Red Hot Chili Peppers, Stevie Wonder, Lenny Kravitz, Thievery Corporation, SZA, Mon Laferte, Julieta Venegas, Ana Tijoux, Bomba Estereo, George Clinton, Antibalas, Budos Band, and Ozomatli. On the strength of their wild and one-of-a-kind shows, they have gained a reputation as one of the most exciting live bands to emerge from the Bay Area in recent years, garnering a diverse fan base that transcends musical, cultural, and generational divides. 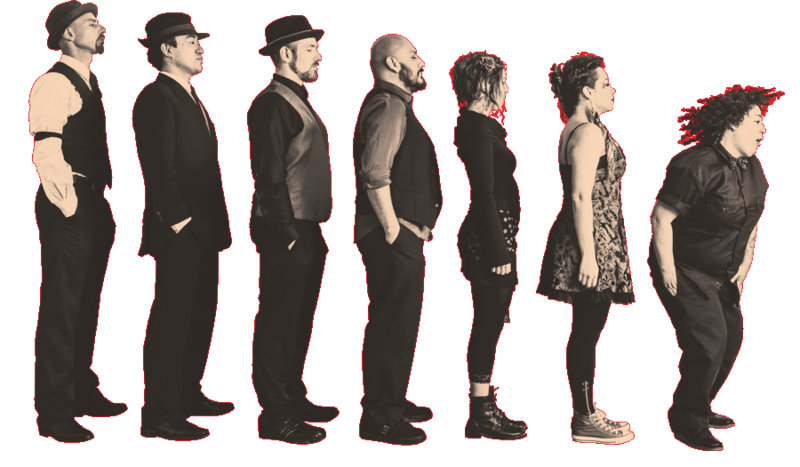 Founded by composer, guitarist, and accordion player, Marco Polo Santiago, the band consists of Colombian-born Diana Trujillo (lead vocals), Justin Chin (tenor & baritone sax), Morgan Nilsen (tenor sax & clarinet), Craig Bravo (drums & percussion), Elena de Troya (percussion), and Paul Martin Sounder (upright bass & percussion). Together, the unlikely collective combines a wealth of musical influences as diverse as their cultural backgrounds, but it’s Marco Polo’s affinity for hip-hop and heavy metal that inspires much of the band’s sound and identity – evident in their name, on-stage antics, and popular t-shirt designs. Now, four years after dropping their debut album, La Misa Negra returns with a self-titled, sophomore effort that they’ve dubbed, “the red album.” Channeling Colombia’s Golden Age, they dive into retro-future cumbia, with tracks like “Me Voy Pa’ Porce” and “Acosadora,” and tap deep into their Afro-Colombian influences by incorporating traditional styles, such as currulao and tambora. They showcase their love for Latin jazz on the monster Salsa tune, “Pistola,” and their hyper-speed reimagining of the Cuban classic, “Yayabo.” They also allude to their non-Latin influences, with instrumental tracks and samples that pay homage to Black Sabbath, Alice in Chains, and Wu-Tang Clan. Finding common ground between their heavy metal leanings and mambo-inspired horn lines, La Misa Negra’s arrangements serve as the perfect delivery mechanism for both their humorous storytelling and exploration of heavier subject matter, like gun violence, water scarcity, and gender inequality. With their second release, the powerhouse septet unleashes 12 tracks that capture the raw energy of their live shows and solidify them as a new force in today’s Afro-Latin music scene.